Legendary researcher Jacques Cousteau made this massive underwater sinkhole famous, but he wasn’t the first to dive its deep blue waters. 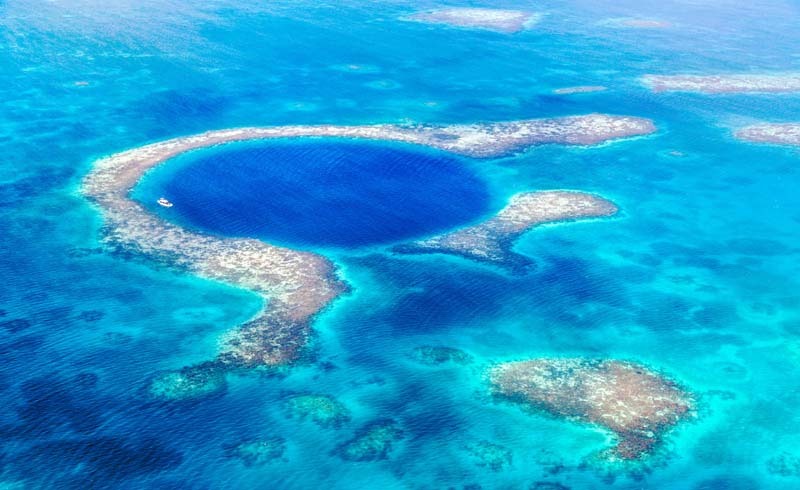 The Great Blue Hole is 60 miles from mainland Belize. To access it, you must travel by boat from islands and port cities that are more than an hour and a half away by boat. It’s isolated and remote, but it draws dozens of curious observers every day. It’s big enough to hold two giant airliners. The Blue Hole is more than 300 meters (984 feet) across and 125 meters (410 feet deep). For comparison, an American football field is 360 feet long, including both end zones. Two Boeing 747 aircrafts could fit in the Blue Hole, with room to spare. The Great Blue Hole is a part of the Belize Barrier Reef System. 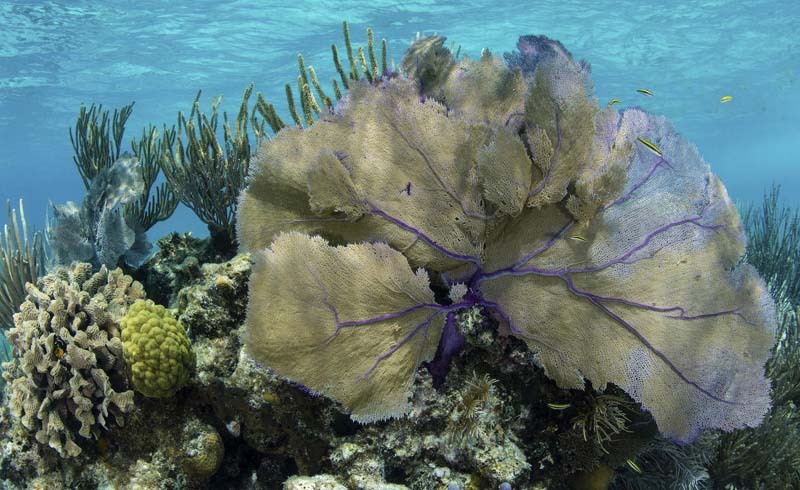 When you travel to snorkel or dive the Great Blue Hole, you won’t be disappointed to know what you’ll have plenty of other dive sites along the way. That’s because the Blue Hole is part of a larger reef system, which is also an UNESCO World Heritage Site. The hole itself lies near the center of Lighthouse Reef, an atoll that is the easternmost part of the barrier reef system. The Great Blue Hole was once a cave. Sinkholes, or cenotes as they’re called in Belize and the Caribbean, pepper the Yucatan Peninsula and Belize. The Blue Hole is a sinkhole formed by the collapse of a large limestone cave sometime after the last glacial period. Rising water filled the cave, causing it to collapse in on itself. You won’t see colorful fish or reefs. If you’re expecting to experience a technicolor rainbow of sea life once under water, you’ll be a bit disappointed. At the surface of the Great Blue Hole, you’ll see some fish and sea life from the nearby shallow lagoons and reefs, but once you begin your descent, everything will become sandy and colorless. However, that doesn’t mean you shouldn’t dive. The glory of the Blue Hole’s depths is in the beautiful stalactites and stalagmites that still hang, proof that this cavernous space was once above ground. You may also see reef sharks, nurse sharks, and grouper hanging out in the Blue Hole. Jacques Cousteau didn’t discover the Great Blue Hole. Famous explorer Jacques Cousteau sailed the world in his research vessel the Calypso, filming his findings and adventures for the television series The Undersea World of Jacques Cousteau. In 1972, for his episode “Secrets of the Sunken Caves,” he and Calypso sailed to a large sunken cave (unnamed at this point), revealing the unique natural wonder to the world. After his initial visit, Cousteau labeled the Belizean reef and underwater sinkhole to his list of top 10 places to dive in the world. In 2018, Cousteau’s grandson, along with businessman Richard Branson and submarine pilot Erika Bergman, dove to the bottom of the Blue Hole to document what it looked like. The Great Blue Hole was named by a British diver. If you watch the episode of Cousteau’s show, you won’t hear him refer to the wonder as “the Blue Hole.” At one point, one of the scientific advisors does call the sunken spot the “blue hole.” However, it wasn’t until 1988 that British diver and author Ned Middleton formally referred to the sunken cave as the “Belize Blue Hole” in his book Ten Years Underwater. There are two Blue Holes in Belize. Another cenote in Belize goes by the name Blue Hole, and it’s nearly as famous as the at-sea Blue Hole. About two miles from St. Herman’s Cave, a still-intact cave system with an underground river near Belmopan, Belize, is the Blue Hole National Park, home to a sapphire pool surrounded by lush tropical forests and greenery. The pool formed as a result of a collapsed cave, with waters bubbling up from the cavern below. It’s a brilliantly beautiful place to cool off after a hot day in the Belizean rainforest. Dive tours should be booked with registered tour companies or hotels with trained staff that lead excursions. Many groups leave from hotels on the Turneffe Islands, Long Caye, Ambergris Caye, or even Belize City. You’ll need to be an experienced diver before you head into the Blue Hole. Most companies require you to have at least 24 successful dives under your belt before you enter the Caribbean wonder. Snorkelers can stay at the top of the hole and in the nearby shallows. Most trips to the Blue Hole, whether for snorkeling or diving, are day-long trips with stops at multiple sites. Prices, stops, and duration depend on which company you choose to tour with.